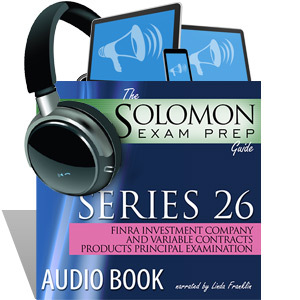 This 9-hour audio recording of The Solomon Exam Prep Guide to the Series 26 FINRA Investment Company and Variable Contracts Products Principal Qualification Examination will give you the content of this invaluable and enjoyable study guide in an audio format. After hearing the book’s well-written content, you will be even more prepared to tackle the Series 26 exam with confidence! The Series 26 Audiobook is a great companion to the Series 26 Online Exam Simulator, the industry-leading online testing program that ensures you are learning and retaining the information. I just passed the Series 79 exam. You guys rock! And your price beats the competitors'. Thanks for the great materials.